Furuno has introduced a new high-performance Chart Plotter designed specifically for commercial fishermen; with all of the features they want and need right at their fingertips. The new GP3700 and GP3700F Chart Plotters combine the most useful features a commercial skipper needs and brings them to life on a 12.1″ Colour IPS display. The GP3700 GPS/WAAS Chart Plotter and GP3700F GPS/WAAS Chart Plotter/Fish Finder combination unit incorporate the easy-to-use interface from their previous commercial model, the GP3500, while adding new enhancements and features that simplify fishing. Dedicated, colour-coded short-cut control keys make operation fast and simple when putting down marks and lines, and user-customizable keys can be assigned to menu items so they are accessible at the touch of a key. A rugged trackball allows the skipper to quickly move the cursor, while arrow keys can be used for more precise control. A dedicated Undo function key allows the operator to go back one operational step, such as removing a mark you just created or restoring a deleted mark or line, while the Redo key allows you to instantly recover your last operation. A large on-board storage capacity makes the GP3700 series a perfect solution for long-term fishing operations, including up to 30,000 own ship track points, 30,000 points for marks and lines, and 10,000 TT/AIS/GPS buoy points. An easily accessed USB port on the front of the unit allows you to store and retrieve data for review or backup/recovery. A screenshot function allows you to capture screen images, so you can review important data gathered on each trip at a later time. A generous 12.1″ IPS screen provides clear visibility, allowing the skipper to read the situation at a glance. A distinctively wide viewing angle offers excellent readability from virtually any direction. The GP3700 series provides and displays navigation data in a wide variety of modes, any of which can be selected by simply tapping the dedicated Display key. Plotter, Compass, Satellite information, and Fish Finder displays can be customized, as the skipper prefers, according to their situational needs. The GP3700F combination unit incorporates a 600-watt/1 kilowatt, 50/200 kHz Fish Finder that brings to bear the very best of Furuno’s extensive Fish Finding expertise. The skipper can display data in a low or high-frequency full screen display, Mix Mode, Bottom Lock, or Bottom Zoom, with an available A-Scope function to show real-time echo returns. By scrolling back the Fish Finder screen, the operator can see the history of recorded echoes to find a specific fishing ground or fish target again, and easily drop a mark to plot a course back to that area. Some of Furuno’s newest and best innovations are included, such as Accu-Fish to detect fish size from 4-80 inches based on the strength of their echoes, and Bottom Discrimination mode that indicates the major component of the seafloor – rock, gravel, sand, or mud. 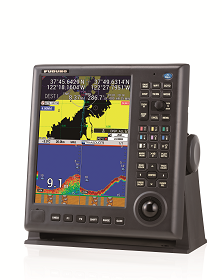 The GP3700 Chart Plotter and GP3700F Combination Chart Plotter/Fish Finder from Furuno are the perfect tools for commercial fishermen to streamline operations and boost their catch. Furuno has introduced a new high-performance Chart Plotter, the GP3700 & GP3700F designed specifically for commercial fishermen.